The Golden State Warriors return to action tonight as they take on the Utah Jazz. 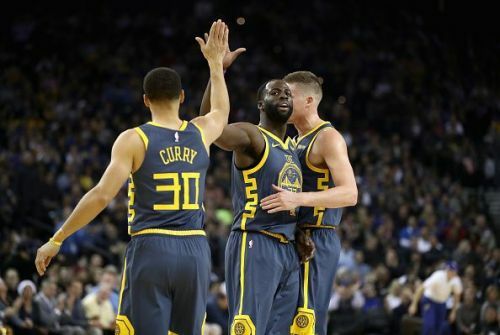 The Warriors enter the game coming off of an impressive 110-93 win against the Memphis Grizzlies, and if the Warriors beat the Jazz, it will be the team's fifth consecutive road game win. After an impressive run in the 2018 playoffs, the Utah Jazz have been disappointing this season. The team is currently outside of the playoff places, and stand out stars such as Donovan Mitchell, Ricky Rubio, and Derrick Favors have all struggled for form and consistency. Despite this, the Jazz are always a difficult team to beat on their home court, and the Warriors will face a firm test tonight. The Golden State Warriors will once again be without both DeMarcus Cousins and Damian Jones. Jones is expected to be out for the remainder of the season due to undergoing surgery on a torn pectoral muscle while Cousins is still not yet ready to make his much-anticipated return. The 28-year-old recently returned to practice with the Warriors G League team, although the All-Star will not return to NBA action until January at the earliest. On a positive note, Andre Iguodala will be involved against the Jazz after overcoming his recent hip injury. The 34-year-old played for 16 minutes during the teams win over the Grizzlies, although Steve Kerr is unlikely to change his starting five. The Warriors All-Star quartet of Draymond Green, Klay Thompson, Kevin Durant, and Steph Curry will all start, while the team's injury problems will once again result in Kevon Looney starting at centre.